Well, it was about time someone figured out what Wardwell was up to. Faced with rampant evidence Wardwell has been pushing her down the road towards the apocalypse, Sabrina finally confronts her over her villainy. And given a more detailed understanding of Sabrina’s place in the apocalypse, Wardwell finally decides to help her. Except, of course, it’s too late. Sabrina has already taken out her innocent yet violent mandrake twin, performing the last perversion of the life of Jesus, and setting the stage for Satan’s return to earth, and her own imprisonment at his side. It’s quite the reversal of fortune for her, considering quite recently she was imagining reforming the Church of Satan in her father’s image. Father Blackwood also has reform on his mind, and makes his big play for power, sectioning his church off from the rest of the Dark Lord’s followers so he can enforce his misogynistic tenets on his remaining followers. He meets almost immediate rebellion from various women, who quickly realize his vision has no place for them. 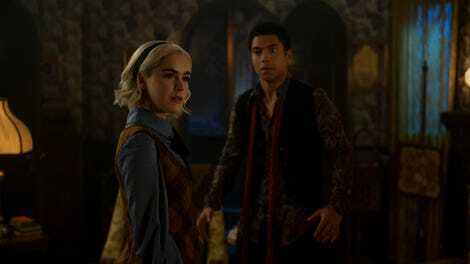 Prudence’s wavering loyalties come into play from the start, as she pleads for mercy for Elspeth, who understandably prefers to support Sabrina’s vision for the church after she saved her life. But she’s not quite ready to break from her father completely, and reveals that Zelda has only been pretending to be under the influence of a spell, only to have Father Blackwood immediately demonstrate how bone-deep his misogyny is. He generally seems to know how to play against Prudence’s desire for the legitimacy he can provide, but his inability to recognize her own protective instincts for her sister, as well as for her own preservation, dooms him. He’s not the only male idiot causing himself trouble. Hilda runs to the Council in desperation, who quickly disabuse her of any notion that they’ll help. But her decision to call them all “arses” is apparently a little too alluring—Methuselah shows up her house pretending to want to help, but really to see if Hilda is into super old dudes. There’s something all too familiar about the respected male elder pretending to care about a younger woman’s input, only to make clear he only ever saw her as a sexual object. Hilda will probably face some repercussions for her actions, but at least Methuselah gets what he deserves: a transformation into some kind of spiderweb mound. Though the mandrake is ultimately dispatched fairly quickly, after Ambrose realizes it has no ability to strategize, it does do some quick damage to Sabrina’s friends. Thankfully, the show does not pretend that any of them would be fooled by that thing, and all of them figure out something is wrong very quickly. Nor are they taken in by the bizarre things it says. The scene with Theo is particularly affecting. While episode 16 spends a little too much time discussing his body, here he’s firm and resolute, cutting off Mandrake Sabrina’s efforts to suggest she can make him a “real boy” and telling her he already is a boy, regardless of what other changes he ultimately decides to make. It’s exactly the argument far too many people would try to make about Theo’s transition; that he shuts it down so completely and decisively could practically be a PSA. 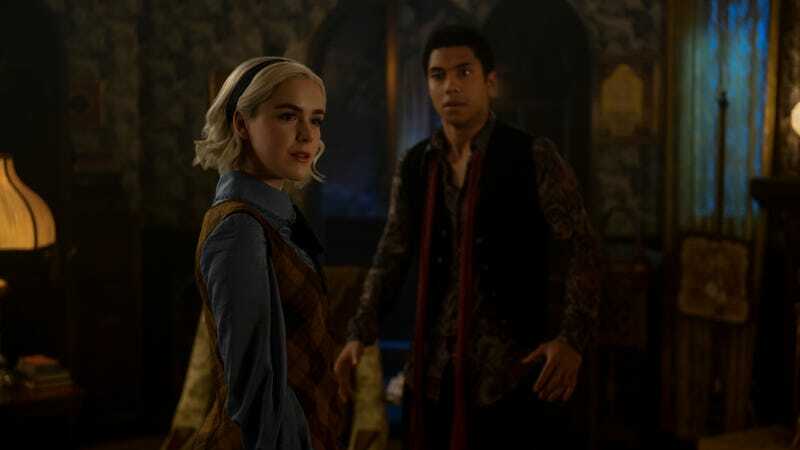 Even Roz and Harvey, despite the very real concerns Roz has that Harvey isn’t over Sabrina, manage to pull together and ignore the terrible things Mandrake Sabrina says to them. So things are a bit dire now for the gang. The apocalypse seems imminent, Blackwood’s still in power, and Sabrina has, well, no power. But for the first time, the various people who’ve been working against each other despite sharing common goals are finally working together. The matriarchy of the Church of Satan may be ready to make its big move as a team. It’s funny, no matter how much Wardwell conspired against her, as a viewer I always wanted her to be on the same side as Sabrina. She was so sympathetic, even at her worst. Wait, if the mandrake was successful, does that mean the river golem was also successful? Does someone need to go check on that? Has anyone ever said “Promise me you won’t do anything rash” without the other person immediately doing something rash? Among the various suspicious things Mandrake Sabrina said, I was most partial to her mournfully saying the ground had been soaked in her friends’ “fluid.” Hate to see that happen to your friends. One of my notes for this episode was “napping next to a turnip doesn’t help,” and while that wasn’t necessarily true as written, it ultimately was not wrong. That was abundantly unhelpful.